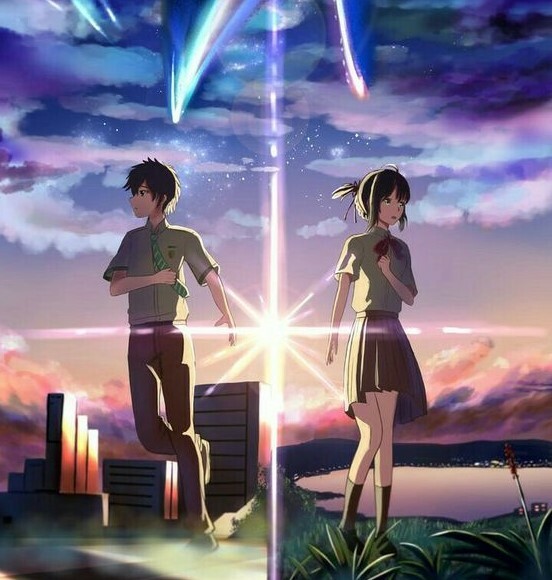 Your name is the Japanese romance film about two teen aged youngsters one a city boy (Taki) who is from the Tokyo and the other a small town girl (Mitsuha). They swap their soul and intermittently wake up in each other’s bodies and live each other’s life. Your name was actually a novel written by Makoto Shinkai. Makoto Shinkai is a Japanese writer, director, producer, animator, editor, cinematographer, voice actor, manga artist and also a former graphic designer born on February 9, 1973. Makoto Shinkai is also known for directing Your Name, which is the highest grossing anime film of all time. The actual novel was published a month before the film’s premier. Mitsuha wakes up and gets ready for the school. When she went to eat breakfast with her little sister and her grandma, her grandma looked at her and said she looks normal today. Her sister told her that she was being so crazy yesterday. Mitsuha gets confuse hearing that. Mitsuha turns on the TV. There were lots of news about a comet saying that it will pass by in a month and can be visible to the naked eye for several days. Mitsuha went to the school with her friends Sayaka and Tessie. At the school when Mitsuha opens her notebook to write on, she founds something written on the pages asking her name. On the lunch break Sayaka told Mitsuha that she was acting strange and weird yesterday, she didn’t knew about her desk and where her locker was. She didn’t even tie her hair. It was like she had amnesia. Mitsuha told Sayaka that she feels like she had been in a strange dream lately, where she lives someone else’s life. Her friends Sayaka and Tessie were worried about her. Mitsuha told them that there is nothing in this town. She wanted to graduate soon and go to Tokyo. Mitsuha’s Grandma told a story of their braided cords. 200 years ago a sandal maker Mayugoro’s bathroom cought on fire and burned down the whole area she continues, the shrine and old documents were destroyed in that fire known as “The Great Fire of Mayugoro”. To protect the heritage,should be handed down. That’s why she wanted her granddaughters to do Miyamizu Shrine which is the important task. Mitsuha and her little sister Yotsuha performed the traditional dance at the town’s old temple. At the end of the performance they made saké also called as “Kuchikamizake” by chewing on rice, spitting it out, and letting it ferment, which becomes alcohol. Mitsuha feels embarrassment because all her friends were came there and they talk about her. Mitsuha hates her pathetic life, she wanted to be a handsome Tokyo boy in her next life so she can live a better life. She done all housework which is left by that person’s roommate. She still thinks that it was a strange dream. When she left the home she surprised realizing she was in the Tokyo. She found her way to school. She meets friends of that boy in whose body she was trapped in called Taki. She went café with them and spend lots of money on eating food. She went to work where (Taki) the guy works, she ended it with a mess but ms.Okudera handled it well. She found out that Taki has crush on Ms.Okudera. She came back home after work and checked Taki’s phone where she found a Diary. She left some notes for him, whatever she did all day long and some love tricks to catch up Ms.Okudra’s heart. Taki was so confused about the last day. He couldn’t catch what was happening with him. His friends realized that he is normal now. On the next morning Mitsuha wakes up in her own room, it was seem normal. She went school but everyone was looking at her weirdly. Sayaka told her that she made a quite scene yesterday. Finally Taki and Mitsuha realized that they are changing their soul with each other’s body, two or three times a week or sometimes randomly and the trigger is sleep. The cause was unknown Mystery. But they didn’t remember actually what happened last day when they switch the places. That’s why they decided to laid down some rules to protect each other’s lifestyles. They started to leave some notes for each other in their phones. Mitsuha helps Taki to get closer to his crush, while Taki helps Mitsuha become more assertive, extroverted and athletic in the school. On another day the news was on the TV about that comet Tiamat will be visible to the naked eye for few days and it is moving from east to west. Taki went with Mitsuha’s Grandma and sister Yotsuha to vessel of shrine’s god since he was in Mitsuha’s body. Mitsuha’s grandma told them the actual meaning of “Musubi”. Musubi is the old term for calling the local guardian deity. These are all the God’s power. And represent the flow of the time itself. They twist, tangle, sometimes unravel, break, and then connect again. That’s what the Musubi is. They offered two bottles of “Kuchikamizake” to the god’s vessel. One was Mitsuha’s and other was Yotsuha’s. They came back home, it took the whole day. Mitsuha’s Grandma recognized Taki in Mitsuha’s body. On the next morning Taki wakes up crying but he didn’t know why. Suddenly he got a message from Ms.Okudera. He was so scared because Mitsuha set his date with Ms.Okudera. Taki and Ms.Okudera spent whole day together but she noticed that Taki was being different. She told him, she noticed that he has someone else in his mind. Taki tried to make contact with Mitsuha but he couldn’t reached. His calls and messages didn’t go through. He just wanted to tell Mitsuha about the disastrous date when they switched next time. But some reason they never switched places again. He drew all places on paper where he went when he was in Mitsuha’s body. He packed his bag and went to search for Mitsuha with Ms.Okudera and his friend Tsukasa. Taki searched all over the places but he couldn’t find her. Finally at one Ramen Shop a woman recognized his drawings. She told him the name of that place which was Itomori. They told him that was the only place where the comet was strike before three years ago and all the people were died. He searched every information, read every article about it. He finally remembered whatever the Mitsuha’s Grandma said about Musubi. He searched for the place where he had been went with Mitsuha’s Grandma which was the God’s Vessel. On the next morning he left alone searching for that God’s Vessel and he finally found it. He just needed one more chance to save Mitsuha and her family. He realize that their timelines were out of step. He went in the God’s Vessel and drinks Mitsuha’s Saké . And the miracle happened. He went back in the past where there was only one day was remaining for the comet strike. He wakes up in Mitsuha’s body. Mitsuha’s Grandma recognized Taki in Mitsuha’s body. She told him that she also had some strange dreams when she was young and her daughter too had them. Taki told Mitsuha’s friends to help him to save everyone from the comet strike so they planed it. They decide to place a bomb at electricity center of the town and hijacking the Broadcast system. Taki tried to talk to Mitsuha’s father who was the mayor but he didn’t listen to him. Taki told Mitsuha’s sister to go out of town before comet strike. Then he realized that he left his body at the God’s Vessel so there were high possibilities Mitsuha would be in his body right there. He took Tessie’s bicycle and went to search Mitsuha at God’s Vessel. Finally they meet each other when the Twiligh happens and again their soul changed and took their own places. Taki gave her red thread which she gave him a long time ago when he didn’t even knew her. He kept it for three years and he wanted her to keep it. Taki told Mitsuha that she has lot to do and he had made a plan to save all people so she must need to carry on as it is. He told her to write down their names on each other’s hand so when the twilight gets over they shouldn’t forget about each other, but only Taki able to do it. They get invisible to each other before Mitsuha write down her name on his hand. The Twilight was over and they started to forget about each other’s name. Taki made a promise that he will found her wherever she would be. They tried hard to remember each other’s name, but nothing goes right. Mitsuha went back to the town. Tessie and Mitsuha placed a bomb on town’s electricity substation. Sayaka announced to get to the safe place from the School’s broadcasting room as soon as the blast happened in substation. She repeats so many times to tell people to gather on school’s playground since it was the only safe place to get survive from the Comet strike. Tessie told Mitsuha to talk to her father and convince him to save the lives. On the way when she realized that they wrote down their names on each other’s hands. She saw that there was nothing but “I love you” written on her hand. She couldn’t remember his name whoever wrote that. The Comet Strikes on the Itomori town. Five years later…Taki was living in the Tokyo, searching for the job. He was always searching for something but he didn’t know for what. Not sure if he was searching for a person or a place. He remembers that the Itomori town had comet strike before eight years ago. But most of the town’s residents were miraculously unhurt. No deaths, 104 were wounded. Most of its residents were outside the blast zone. He read those articles intently back then. He feels, he didn’t know anybody in that town but still he was so curious about it and thinks that something was there which was connecting him to that incident. On one day Mitsuha and Taki crossed the path. He stopped her and asked did they meet before or did they know each other. Mitsuha replied that she also thinks like they had meet each other before. To talk about the personal opinion then, this is the best Animated Japanese Movie I have ever seen in my whole life. Since it is Animated Fantasy and Romantic Drama film, I love the way it is. This is so addictive, full of fantasy drama, pretty catchy too and also it makes you curious about What’s Next ??? It is like some kind of mysterious story. The animation is the perfect in itself. Each step of it seems original. They gave it to the natural effects. I can watch this drama over and over again without getting bored. The OST’s of this Film are AWESOME!!! And the lyrics are also pretty good though. “Your Name” is available in different languages and subtitles. Also the OST’s of this Film are available in English. Next articleHyunA & Pentagon’s E’Dawn officially admit they’ve been dating for 2 years!